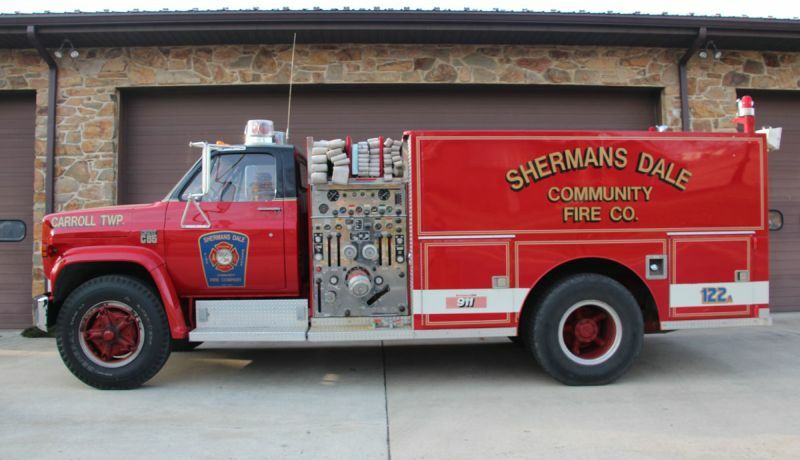 WE ARE IN PROCESS OF REPLACING OUR 1985 RESCUE/PUMPER DUE TO EXCESSIVE RUST AND PROBLEMS WITH AQUIRING REPAIR PARTS. THE NEW RESCUE IS DESIGNED FOR ALL TYPES OF RESCUE SERVICE. ALL THAT IS LEFT IS TO RAISE ENOUGH MONEY TO PLACE THE ORDER. CURRENTLY WE ARE IN THE PROCESS OF APPLYING FOR A GRANT. ANY AND ALL DONATIONS TOWARDS THE PROJECT WOULD BE GREATLY APPRECIATED. Hello. I am just giving you an update on the truck. We just got it decaled and did a little something for Marlin since this was his “baby”. We love the truck. It has been on 4 calls so far and it performed great with no troubles. We just had the local newspaper her at the fire hall this past weekend to do a story on the truck. When it comes out we will be sending you a copy of the paper for your scrapbook. Again thank you all for all you have done for us. West Valley Vol. Fire Dept. 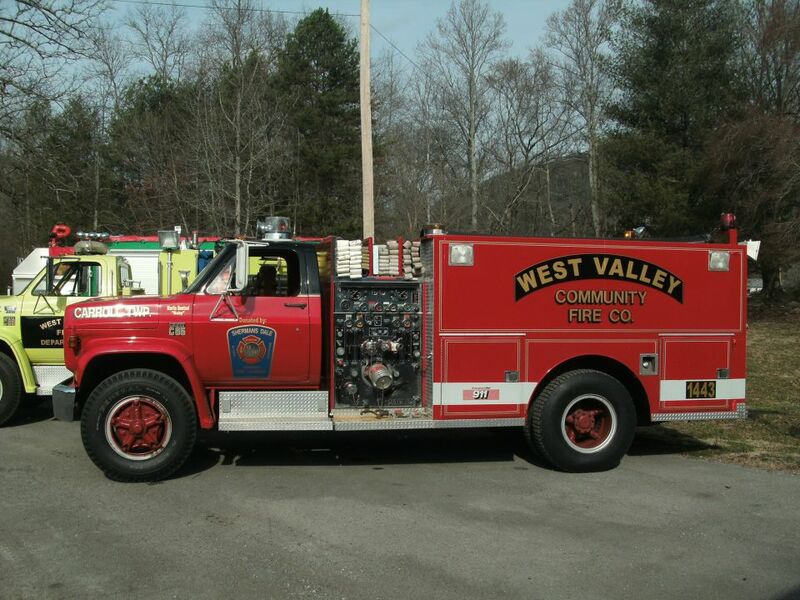 During the October 2012 Fire Company meeting a letter was read from the West Valley Volunteer Fire Company from Whitwell, TN concerning the 1973 Chevy/Darley Tanker. A few months prior we had sold them old equipment that we were no longer using. They noticed the tanker and asked if we were selling it. A few months later we received this letter. 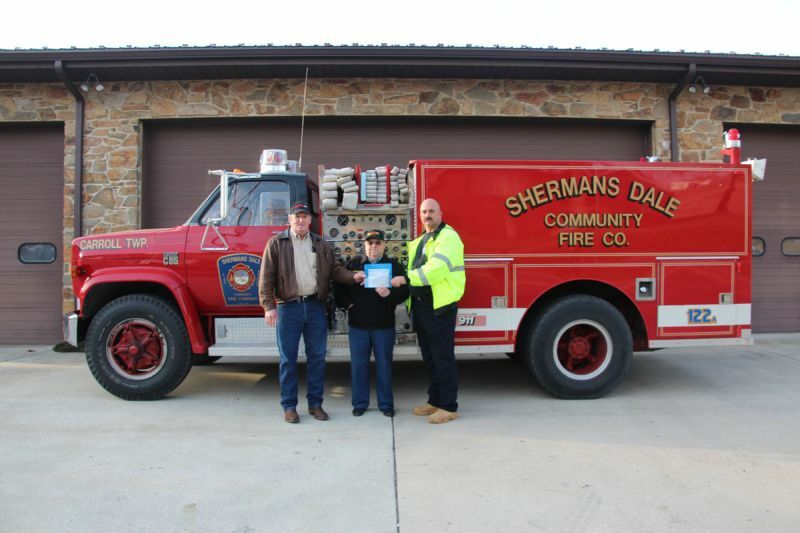 The company talked about what there ideas were for this piece of apparatus and the motion was made to donate the 1973 Chevy/Darley Tanker to the West Valley Volunteer Fire Company. 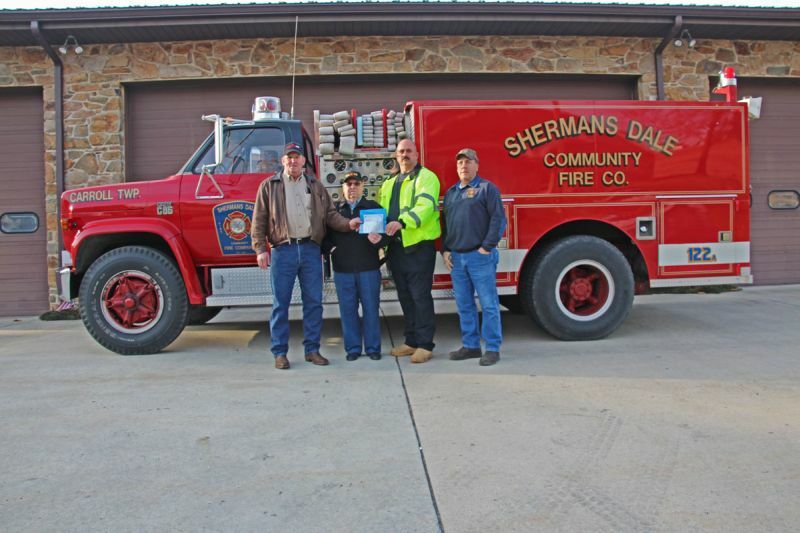 The members of the West Valley Volunteer Fire Company made the trip up to Shermans Dale, PA on December 15, 2012 to receive there new apparatus. This piece of apparatus has served the communities we protect for many many years and we hope it will do the same for West Valley and the community they serve as well. 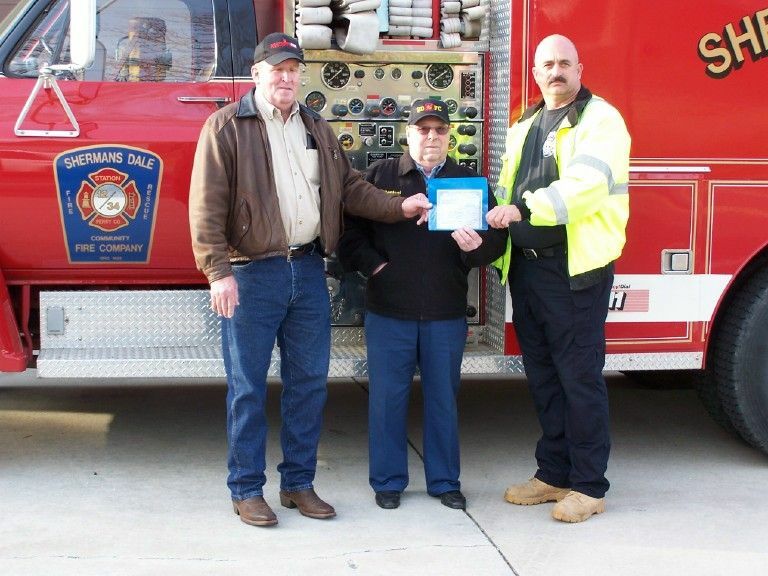 Assistant Treasurer & Oldest Active Member Marlin Bentsel of the Shermans Dale Community Fire Company is presenting the title for the 1973 Chevy/Darley Tanker to Deputy Chief David Newcomer of the West Valley Volunteer Fire Company. 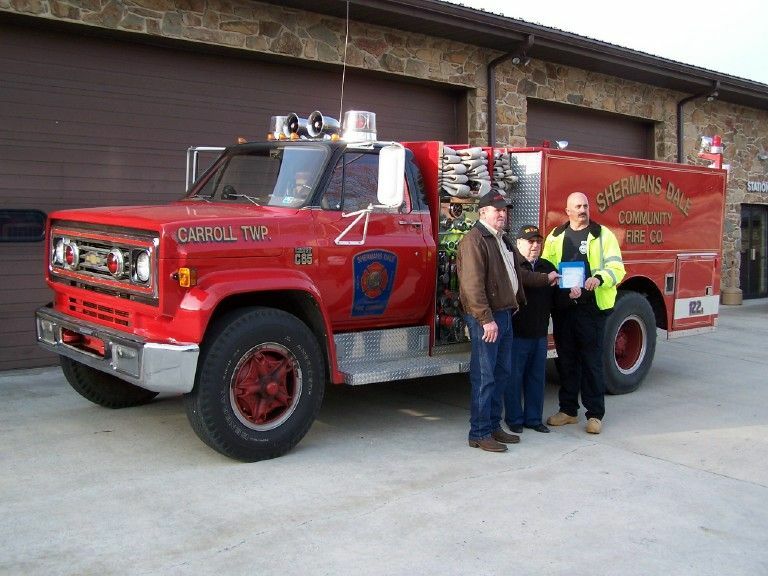 This piece of apparatus will help provide additional service to the communities they serve.